Following a vote, the European People’s Party (EPP) membership of Hungarian party Fidesz has been suspended with immediate effect (190 in favour, 3 against) after a decision by the EPP Political Assembly. The suspension entails that Fidesz will no longer be present at any party meeting, nor have speaking time, nor voting rights, nor the right to propose candidates for posts. “EPP is a party of values and each member must abide by the principles that unite us. Today, internal democracy has spoken. Following the request of 13 members parties, we voted to suspend Fidesz until further notice. This decision was not taken lightly. As the party of Europe’s Founding Fathers and many European successes, EPP is and must remain a beacon of values. All our member parties must lead by example. An Evaluation Committee will be monitoring Fidesz’s implementation of the conditions agreed. 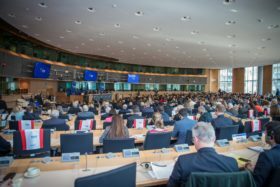 The body will be chaired by Former President of the European Council and Former Prime Minister Herman Van Rompuy (Belgium) and composed of Former European Parliament President Hans-Gert Pöttering (Germany) and Former Chancellor Wolfgang Schüssel (Austria). They will present their report to the EPP Presidency in due course. The EPP is the largest and most influential European-level political party of the centre-right, which currently includes 80 parties and partners from 42 countries, the Presidents of the European Commission, the European Council, and of the European Parliament, 9 EU and 3 non-EU heads of state and government, 14 members of the European Commission and the largest Group in the European Parliament.